One person was killed while many narrowly escaped death in Moniya area in Ibadan, Akinyele local government area of Oyo state on Friday as officials of the Federal Road Safety Corps (FRSC) engaged a cab driver in a hot chase. The FRSC van marked 1139 (3) and the Micra car with number plate Lagos 831 DH were badly damaged as they both plunged into a deep ditch. was speeding away, the officials rather engaged him and both vehicles crash landed with officials also sustaining injuries. commercial car. The officials were trying to overtake the car and in the process both of them plunged into this wide hole by the roadside. because it was not painted the normal commercial colour. The passengers in the car were shouting and pleading with the officials not to risk their lives, but they did not heed their pleas. “Like a movie, we just saw and heard a deafening noise after they crashed. The Micra car summersaults before it crashed into the ditch followed by the FRSC van. 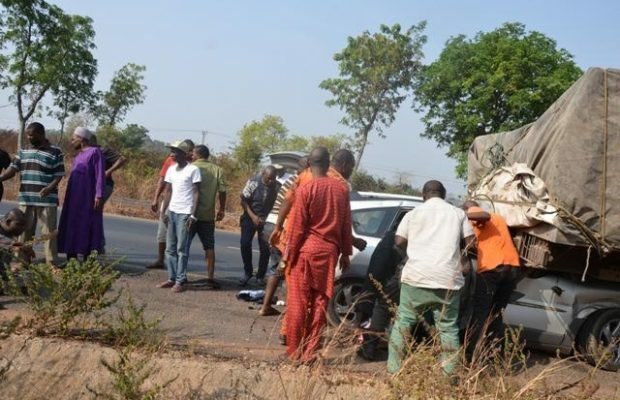 Several Micra drivers who were wailing uncontrollably over the reported death of their colleague identified as Akeem Ibrahim, had mobilised themselves against the FRSC officials. But the timely intervention of five Hilux police vans with scores of policemen curtailed the angry drivers. The Oyo state police command confirmed the death of one person in the accident. both plunged into a ditch. One person, as at the time when the matter was reported, was confirmed dead. The Public Relations Officer of FRSC, Mr Oluwaseun Onijala could not be reached for comment as at the time of filing this report.